Powerful, versatile and easy to use backup and disk image software. X-Backup is able to create classic archive file in zip file format and disk partition image. It supports backup to external USB hard disk, CD/DVD, FTP or HTTP server, from and to network drive. 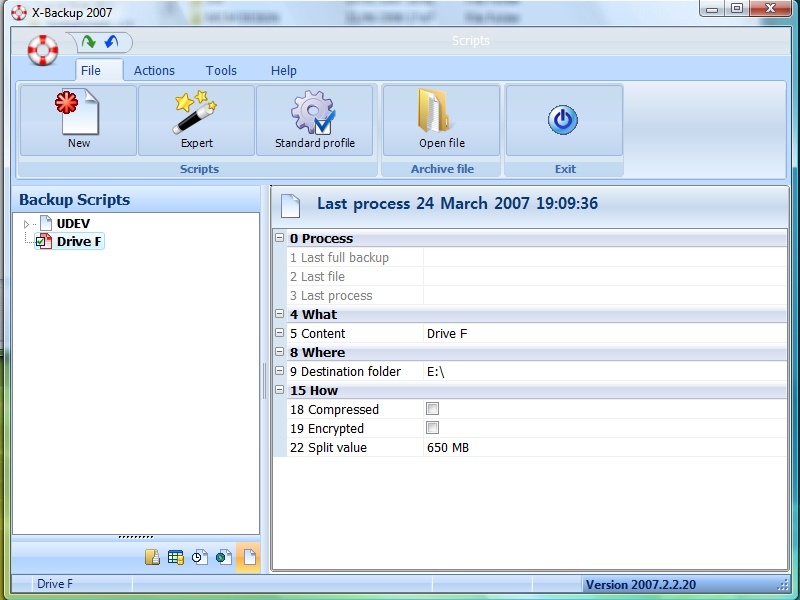 Through a modern interface you can quickly access to the Backup geography, the Backup timeline and the Backup report. X-Backup can encrypt archive files and disk partition image using AES. ...... tasks. The Backup report to get the status of each backup job. Options are limited to the essential to easily create backup definition, but include AES encryption (256 bits), retention period. It supports full, incremental and first full then incremental backup mode. X-Backup offers multiple ways to restore files. Predefined backup definitions helps the user to quickly create a new job. A Quick restore function helps the user to restore a file or group of files quickly. Backup is built in verify function. Disk image can be compressed or not, encrypted using AES. X-Backup can be used as well in professional environment as for home computing. Fully compatible with Microsoft's Virtual Shadow Copy technology, it is able to backup and copy open files even locked by another application. Built using Office 2007 looks and feel. Lets you backup restore and move your Outlook Express identities. An easy-to-use backup utility packed with lots of powerful features. Qweas is providing links to X-Backup 2008.3.1.3� as a courtesy, and makes no representations regarding X-Backup or any other applications or any information related thereto. Any questions, complaints or claims regarding this application X-Backup 2008.3.1.3� must be directed to the appropriate software vendor. You may click the publisher link of X-Backup on the top of this page to get more details about the vendor.